Citing Sources Finds James Albert Faulkner, M.D., M.P.P. Thanks to the viewing of a RootsMagic webinar, I was able to get more organized in achieving my goal of recording source citations for all of the facts in my genealogy (RootsMagic 4) database. Unfortunately, also thanks to the same webinar and the subsequent listing from my database of the the facts needing a source citation, I can see how large a task I have in front of me. Although I wrote down source citations when conducting research before the computer age, once I started using electronic data and was able to save document images, citing sources in my database seemed pointless. After all, I had a copy of the original record electronically saved and filed on my computer hard drive. The more I researched, the more documents I gathered. Things seemed good, going the way they should. That is, until I realized that I couldn’t possibly remember which of the hundreds of electronic records went with which facts. So I started citing sources but frankly did a poor job of it, so poor in fact that some of these citations are now meaningless to me let alone someone else who might review my work. Forunately, I am much better at citing sources now, with proper form and detail. I decided to start the task of citing my sources with large family branches that I haven’t ‘visited’ that much lately. The first large family branch I set out to tackle was the Faulkners, the family of my wife’s paternal grandmother, Charlotte Marion ‘Lottie’ Faulkner. Lottie Faulkner lived her life in Saskatchewan, Canada but her family’s roots go back to Ontario, to New York State, to Connecticut, New Hampshire, and Revolutionary War era Massachusetts. It was Lottie’s great grandfather, Sylvester Faulkner who moved the family into present day Ontario, Canada in the early 19th century. While Lottie and my wife are direct descendants of Sylvester Faulkner and his wife Mary Cram, another descendant whom I was already aware of was James Albert Faulkner. Sylvester and Mary had nine children and all lived into adulthood so there are many descendants. Like Lottie, James was also a great grandchild of Sylvester and Mary. James was born to Sylvester and Mary’s grandson, Dr. George Washington Faulkner, in 1877 in Stirling, Ontario. As a young man, James attended first McMaster University in Hamilton, Ontario and then McGill University in Montreal, Quebec where he studied medicine. Upon graduating as a physician in 1904, James returned to Hastings County, Ontario and established his medical practise. Numerous Faulkner family histories indicate that James served as the Medical Office of Health for Thurlow Township in Hastings County for as long as thirty-seven years. While checking my sources for information and completing proper citations about James, I discovered that he also served the Province of Ontario in a political role. The year was 1934 and the majority provincial Conservative Party government of Premier George S. Henry had fallen out of favour with rural farmers and with the population at large who were suffering from the effects of the Great Depression. James accepted the rival Liberal Party nomination to stand as a candidate for the provincial legislature representing the riding of Hastings West. 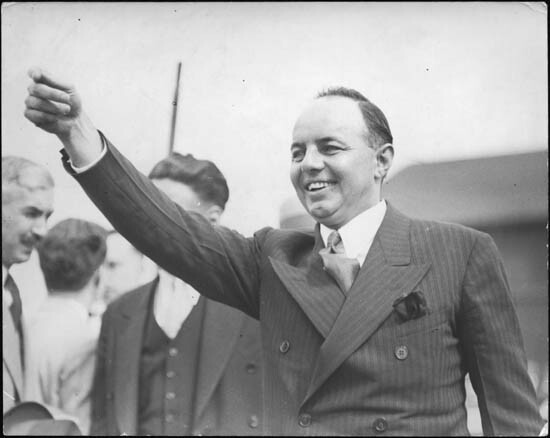 On 19 June 1934, James was elected along with 68 other provincial Liberals who swept to power with a majority government under the leadership of newly elected Premier Mitchell F. Hepburn. James only served a single term as a Member of Provincial Parliament but during that term, according to the Ontario Legislature’s history of past members, he held the prestigious Cabinet role of Minister of Health, in addition to serving on several legislative committees. Although Premier Hepburn’s government was returned with a majority again in the October 1937 general election, James left politics and returned to work in the region of his birth.